Bake a festive treat. Entries can be anything from a cake or cookies or even a log or a loaf. As long as it tastes good and looks as Christmassy as possible then we can't wait to see and taste your creation. 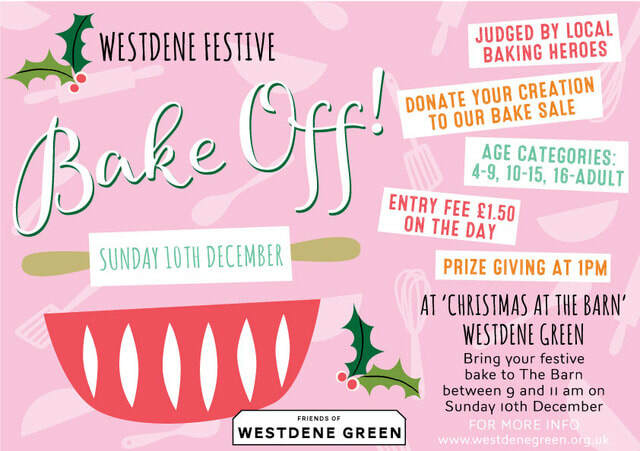 Bring it to the Barn on Westdene Green on Sunday 10th Dec between 9 and 11am with your £1.50 entry fee. We will be there to meet you to help position your bake for all to view. We will then make a note of the name of your cake and please state whether there are any allergenic ingredients such as nuts within it. All bakes will be judged by local baking heroes Sharon Fisher from Baked Bliss and a true lover of all things baked, Councillor Nick Taylor (our local Councillor!). After judging at 1pm at Christmas at The Barn you will be able to take your treat home or donate it to be sold at the cake stall at the Fair. All proceeds will go to towards creating events for our community.